Dude. We don’t have guns in order to make you or anyone else “safer.” We have guns for the amelioration of tyranny. Show me a study that demonstrates you or anyone else will be successful in disarming us? I’ll wait. In the mean time, mind your own damn business, jerk. Via TCJ Western correspondent Ned Weatherby, this sad, sorry tale. Eh, whether it’s a column or patrol car in Florida or hotel floor in Las Vegas, I’m just glad the cops had something to hide behind and that they went home safely at the end of their shift. Officer safety first, of course. And if things like this don’t dissuade you from the belief that the cops are there to protect and defend you, then you believe in fairy tales, myths and children’s story books. Via TCJ Eastern correspondent Fred Tippens, this bear was pissed. KNOXVILLE, Tenn. (WATE) – A bear was spotted Wednesday afternoon walking around the parking lot at an East Knoxville Cracker Barrel. Restaurant staff said the bear was spotted in the Cracker Barrel parking lot off of Millertown Pike near Knoxville Center Mall. They said the bear got startled by people getting out of their cars and began jumping on parked vehicles and scratching them, damaging several. Mckensi Burchell, from Blaine, was at Cracker Barrel when an employee told them to look outside. Pretty high, I think. Carry guns, boys. And speaking of bears, Dean Weingarten at Ammoland has a really interesting article up where he mostly lifts citations out of prior exchanges between a bear expert and park rangers on the best way to defend against big-boy bears. Spray or guns. You be the judge. I’ll carry a gun with me. The moral of the story is the 3-second rule. Be prepared, be practiced and be perceptive. That stark disparity reflects a failure noted by critics on and off the Court. After waiting more than two centuries to acknowledge that the Second Amendment imposes limits on legislation, the Court has passed up dozens of opportunities to clarify the extent of those limits, leaving the task to lower courts that are often hostile to gun rights. District of Columbia v. Heller, decided on June 26, 2008, overturned a handgun ban in the nation’s capital, finding it inconsistent with the Second Amendment right to use firearms for self-defense. Two years later, the Court overturned a similar law in Chicago, confirming that the Second Amendment constrains states and cities as well as the federal government. Aside from those two landmark decisions, the Court has enforced the Second Amendment in just one case. In 2016 it ruled that the Supreme Judicial Court of Massachusetts had flouted Heller when it upheld that state’s ban on stun guns based on the mistaken premise that the Second Amendment applies only to militarily useful weapons that were in common use when it was enacted. Well, there are two things at work here. First, regular readers know that I consider the Heller decision to be weak. Scalia did an awful job with it focusing on self defense, when we know full well that isn’t the framework in which the second amendment should be interpreted. The conversation would clarify a great deal (and get off of the “well regulated” part) if it focuses on the overthrow of tyranny rather than self defense. Then “well regulated” can be seen in the proper context, i.e., well regulated and calibrated firearms which the shooters knew how to use. Scalia left an opening as wide as my truck for the controllers to drive through. Furthermore, his statement that their ruling doesn’t amend the obviously necessary rules for prohibitions in certain sensitive locations (my wording) doesn’t help in the least. Then there is the issue of recalcitrant judges who don’t care about the constitution or God-given rights. McDonald was a “make-me-do-it” case, just as other such cases following have been. And no one has made them do it yet. It’s still impossible to get a concealed handgun permit in Hawaii, New York or New Jersey. For these recalcitrant judges, the best solution is for them to be treated as the traitors they are. Following up this post, this video documents the legal response to the Miami Beach Police Department thus far. The LEO point that they are allowed to point weapons at armed men even if armed legally (for the purpose of officer safety) is idiotic beyond belief. If that’s true, they should go around pointing weapons at everyone since anyone could be concealing a firearm. At any rate, this point of logic will be lost on LEOs since .. well, just because. Via reader JoeFour, this link is an veritable encyclopedia of knowledge of the 1911. I intend to print it out, read it, and keep it handy. In the mean time, it would be nice if readers would peruse the contents and lift the important things out for us here, or merely the interesting things to you for commentary and discussion. What Happens When You Are Disarmed By The Authorities? Via WRSA. Bad things. That’s what. Before the 1945 Soviet occupation of Romania, the people had the right to own guns. I remember my father telling me his dad owned a double barreled shotgun he used to hunt rabbits with as well as a Luger picked from the retreating German troops (German soldiers were getting rid of all their military equipment by simply throwing it out of the troop transport trains). When the communists took power in 1949 following falsified elections, the first law they enacted was total gun confiscation (for the greater good of course).Then after they made sure the population was disarmed they started the arrests, imprisonments, reeducation camps and killings. So practically since 1949 it was illegal to own any firearms in communist Romania. Then there is this very important observation. Listen carefully dear men. After so many years of restrictions and servitude for over two generations, the perception of the Romanian population about gun rights changed in worse; I must admit when I first came to the US I too was surprised to see how owning guns is something normal and affordable and I too believed guns in the hands of untrained people can be dangerous (and keep in mind I served 2 years in the military so I was familiar with firearms). After so many years of war and occupation the overwhelming majority of the people were sick and tired of the war so they believed what the propaganda of the new regime was telling them. They were lied that the government will protect them, that guns must be surrendered for their own safety, that since the war is over there is no need for guns anymore. I’ve made the same observation before, albeit thankfully without first hand knowledge. Every single one of the genocides in the twentieth century – every … single … one – from Hitler to Stalin to Pol Pot to Idi Amin to the Turkish Ottoman Muslim extermination of the Armenian Christians, was preceded by gun confiscations. Nothing good ever comes from surrendering your firearms. The founders knew that and gave us the 2nd amendment – if we can keep it. And again, make careful note that reeducation and propagandizing is all part of the larger strategy for subduing the American culture to the wishes of the controllers. While traditional open carry is generally banned, Florida law allows the open carry of handguns while hunting or fishing. To be clear, you can wear an exposed handgun in a holster if you’re fishing — period. It’s completely legal. There are a few other exceptions. This fishing exception was apparently unknown by Miami Beach police officers Sunday morning. The results were almost tragic. Thank God no one was killed or seriously injured. 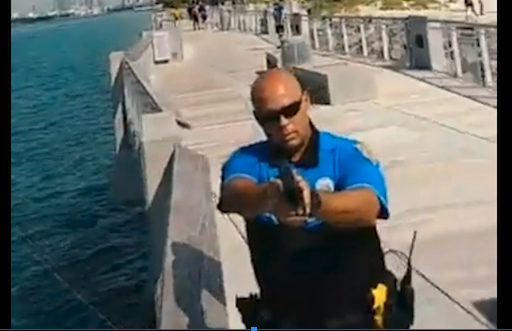 A group of fishermen — who were lawfully open-carrying handguns — was fishing off of the South Pointe Pier in Miami Beach Sunday morning at around 10:40, when they were confronted by Miami Beach police officers. At some point during the confrontation, a Miami Beach police officer pointed his gun at the group. At least one man was unlawfully detained and his weapon was confiscated. Police injured one man’s shoulder when they took him to the ground. He was later transported to a hospital. So now do you want to hear how the MSM reported this event? Hold on to your breeches boys. Six armed people who were fishing Sunday morning at the South Pointe Pier in Miami Beach were detained by police and then released. The anglers, whose guns were openly displayed on their hips, cited a state law that allows people to carry a firearm while fishing, hunting, camping or attending a gun show, said Miami Beach Police spokesman Ernesto Rodriguez. Park rangers spotted the group about 10 a.m. Sunday and summoned police. The anglers were questioned by police but allowed to stay after mentioning the state law, Rodriguez said. It all sounds so peaceful and well-intentioned, yes? So here is a question for you. Abundance of what caution? Exactly what did the police think they were protecting? But the MSM reporter doesn’t go there, because like all MSM reporters, she got her talking points from the cops. The MSM is an organ of the state. It always has been, it always will be. Unholstering a weapon and pointing it at someone who is peaceable and innocent is the most idiotic, irresponsible, dangerous and thoughtless thing a person can do. The cops truly are morons of the highest order.